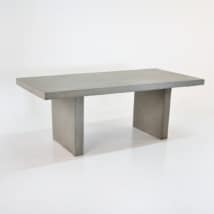 Create a clean, chic and contemporary edge on your patio or in the backyard with the Raw Concrete Dining Table 39”. 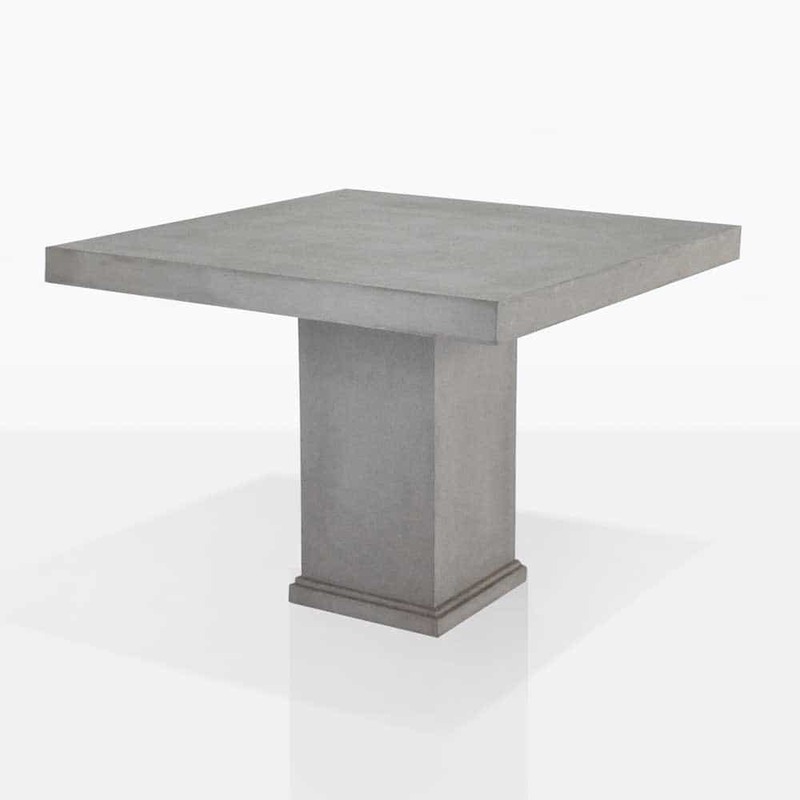 The Raw Concrete Dining Table 39” features perfect 39 inch square table top with a pedestal base, and made out of a unique concrete composite product that wont weigh heavy on your area. Its clean lines and convenient size makes for a wonderful piece to enjoy light lunches, intimate dinners and a place to unwind all in the comfort of your own home. W39" x L39" x H30"
At Teak Warehouse, our concrete composite is made out of fiberglass, resin and concrete, giving a stronger, lighter and longer lasting piece while still holding all the properties of concrete. Concrete has become an increasingly popular choice for both indoor and outdoor furniture. It’s robust nature, contemporary edge and cool demeanor makes it a must for the modern home. While maintenance is easy on these beautiful products, we like to remind our customers that concrete is a porous product and, left untreated, it will absorb liquids and oils and develop hairline cracking in extreme heats. None of these things will affect the integrity of the frames and actually add more character to the pieces. To eradicate the problematic spills, you can purchase a matte concrete and grit sealant from your local hardware shop. These products can be applied once a year. Otherwise, it’s easy sailing! Simply wipe your table down after use and you will be enjoying an impressive looking table for a long time! Love to mix and match? At Teak Warehouse we cater to all your outdoor furniture needs! As well as raw concrete, we carry a huge range of A-Grade Teak, Stainless Steel, All Weather Wicker, Batyline® and Textaline®, Sunbrella® and Reclaimed Teak products. Pair up your Raw Concrete Dining Table 39” with some gorgeous recycled teak stools, or keep it edgy with a Textiline® and teak dining chair! We have everything from relaxing chairs to umbrellas, deep seating to delightful dining sets, benches and loungers and much, much more. Everything is listed on our website, and we encourage you to call us too! Sales assistants are in store every day from 10am, ready to take you through our incredible pieces in detail. We can discuss your space and what you’d like to achieve within it, and then provide you with options. The Raw Concrete Dining Table 39” can be placed in a small courtyard with some dainty aluminium stacking chairs for a modern and modest vibe. Have an empty, lonely apartment balcony with a view? Let’s change that sad space into a spectacular one with the Raw Concrete Dining Table 39” and four of our comfortable wicker dining chairs, complete with a Sunbrella® pad. You’ll soon be sharing company with your friends in style with this fabulous setting. Perhaps your kitchen-dining area indoors needs a bit of pep? Many of our customers have bought our concrete products for indoor use to add an edge to a warmer setting. 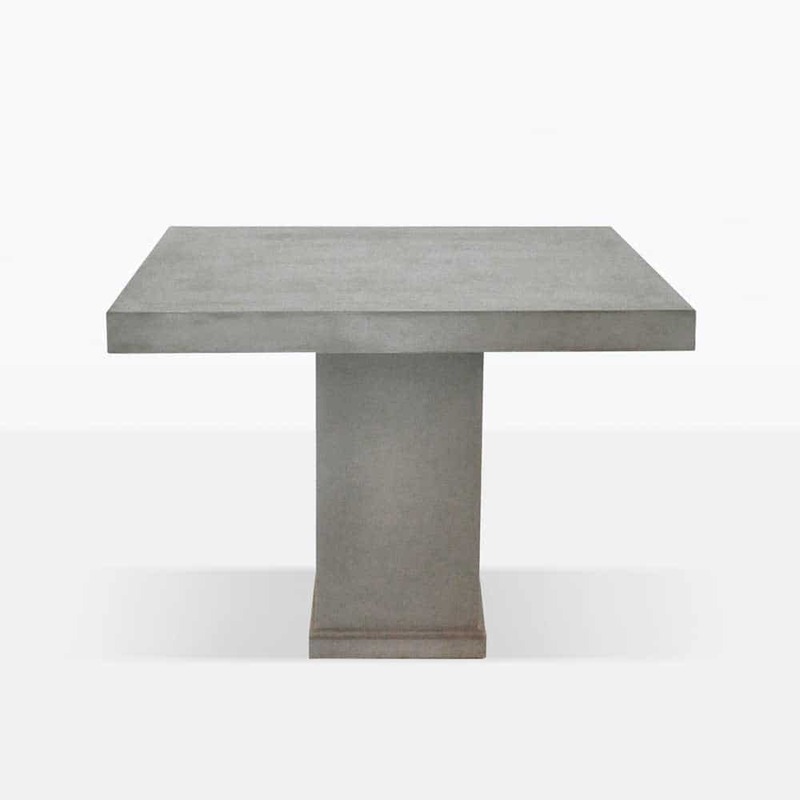 Elegant, modest and on-trend; the Raw Concrete Dining Table is a brilliant choice for your garden, patio or porch! At 39 inches squared, this table is an ideal size to cater to small dinner parties or for the ultimate morning coffee setup with a couple of comfy wicker chairs! The Raw Concrete Dining Table features a simple, classic design with a square table top and pedestal base with a pillar-like indentation at the bottom of the piece giving it a slightly more regal appeal. Whether inside or out this table will add a modern flourish to whatever area it is set in! Versatile and useful; combine the Raw Concrete Dining Table with concrete stools, or teak and wicker for a more eclectic look. The staff at Teak Warehouse are on hand to answer your questions and help with configuring the best outdoor setting for you! Call our 1-800 number now! 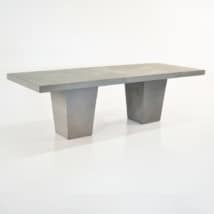 The Raw Concrete Dining Table 39” is a unique choice with many options for placement; order yours today to begin to enjoy contemporary dining in your own home!